it has been more than a month since the grandma brought my baby to visit her Beijing relatives, and said after the open ceremony of 2008 Olympic game the grandma will return Qiqihar with my baby. 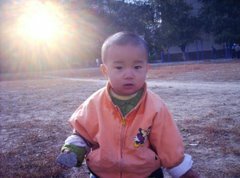 i hated the grandma, for lingering in Beijing so long and let my baby's growth evade his parents' appreciate. sometimes i felt quite worry about putting my baby in a profane environment like the Beijing relatives'home, but God let me let it go. last night my baby appeared via online video chat, and he really in high mood as usual. i prepared a lot of games on dvd or on hard disk of my home pc, all awaiting baby's return. i love him just like i love God. these days like real summer day in my home town, hot and sultry, except yesterday a cloudy day. i love summer, for its brilliant sunshine, which the only mean to drive dark and shadow and cold. the universe we known all concerning light, just as stated in bible, only God can appreciated other means out of light, or knowledge, or birth of our universe. God is the possible and impossible. these day i usually busy in office. google offered so many breathtaking new service that i can't not to break my neck to catch up with them. i adding brick with brick onto my site and fine tuned it,let my cyberspace presence more apparent and dominant. i prepared all my space to accept people around the globe to elaborate the wonder of life and the task of China democracy under the Royal. i know it took time to see the torrent join into river and i m ready. the 2008 summer Olympic game in Beijing will open in tonight. i m much indifferent about it. the whole nation summoned for the battle of the dictating party, under a single squad dictator, for his evil demonstration that no matter how evil as he can, he can party with world leaders from world democracy. the squad dictator tried all means and all times to rule mercilessly on pressing to its ultimate of the suffering of Chinese and China to seduce and despise world consensus and response ability. that's right, any dog has its day to bark, as well as the day it down. bye. that's my life these days. i look forward more engagement among group discuss, and wilder joy with google's more and more powerful common people's tool for richer online content and voice.